What is a Speakap Application? A Speakap Application is a web application, typically provided by a third party, which is integrated into the Speakap platform to provide specific functionality to Speakap users. Users access the application from Speakap’s own web application or a Speakap mobile application, after which the application is embedded into HTML iframe and presented to the use. 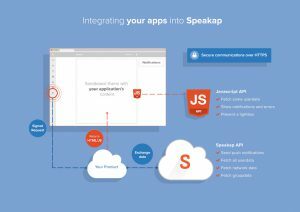 Speakap Applications typically involve a server-side component and a client-side component, each of which has their own methods communicating with the Speakap API.